It’s two days to go before we open our Kahu Ora Living Cloaks exhibition – and time to give you a little preview of what you will be able to see from Friday 8 June. When an exhibition opens and all the taonga are in place, the graphics are up, and the lighting is done it’s hard to imagine all the work that’s been going on to get the exhibition installed. Last week, at a quiet moment, they let me into the gallery to see how things were going. 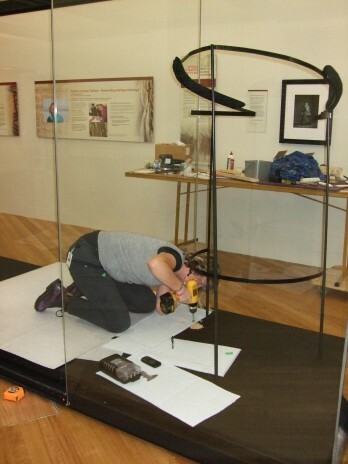 Here is Sam, one of our exhibition team installers, preparing the case and mount to display the unique huru kuri, dog-skin pelt, cloak which we featured in an earlier blog post. Sam Wallis preparing the case and complex mount for the huru kuri, dog skin pelt cloak, on loan from Puke Ariki, photograph by Pamela Lovis, copyright Te Papa 2012. The exhibition graphics are the work of graphic designer, Wol Jobson – here he watches over the install of some of the larger wall graphics. 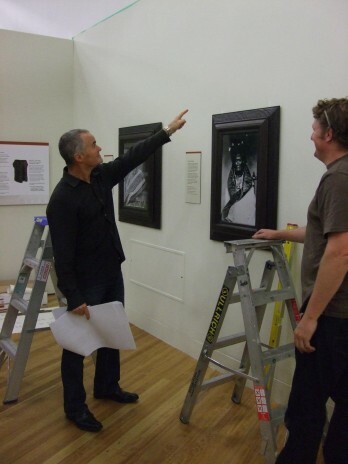 Wol Jobson, graphic designer, supervises install of some of the exhibition graphics. Photograph by Pamela Lovis, copyright Te Papa 2012. And finally, before I give away too much – here are several kākahu installed in their cases but carefully covered up until later this week when the conservators will come in and remove the covers. 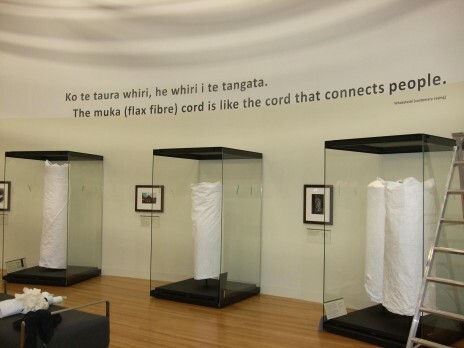 The muka (flax fibre) cord is like the cord that connects people. Muka is the silky fibre extracted from the leaves of harakeke, or flax. After hours of skilled preparation Māori weavers use this muka to weave the kaupapa, or foundation, of a kākahu. Kākahu in their cases, soon to be revealed in the Kahu Ora Living Cloaks exhibition. Photograph by Pamela Lovis, copyright Te Papa 2012. So cloaks, or kākahu, are all about connections – the threads that weave us together as people, and the stories that connect people and kākahu. Come and see for yourself, in Kahu Ora Living Cloaks from this Friday 8 June. I would love to see this display but live in Queensland. Is there any chance of it coming across the Tasman? thanks Karen – I wish you could come and see it too! The blessing and opening of the exhibition on Thursday morning after our Matariki celebration went well – the kakahu look amazing and we’ve had really good feedback.